The conflict between Steve , and Jon, and Chris was Brian Lane's(manager) work.Steve and Rick were never friends.Their only affinity was musical .End of the story. 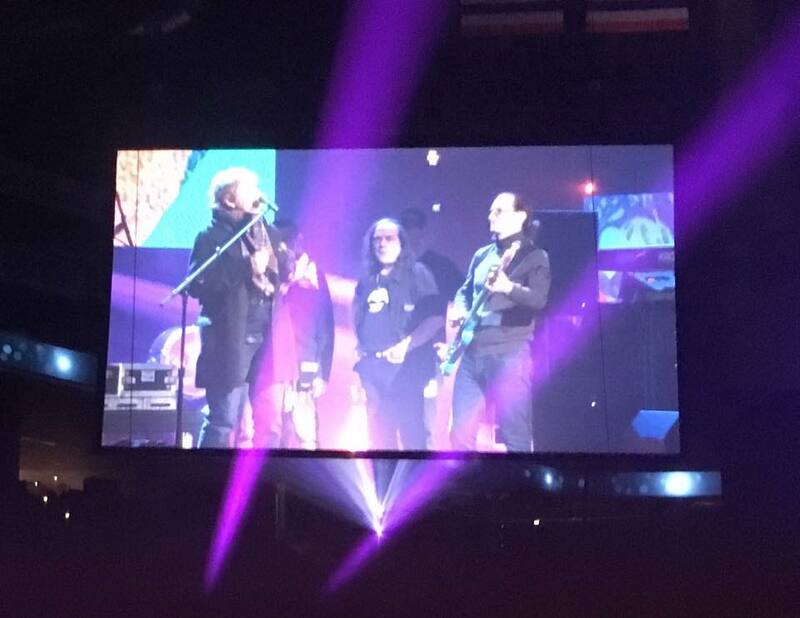 Yes (line-up: Steve Howe, Alan White with Jon Anderson, Rick Wakeman, Trevor Rabin) performed "Roundabout" (full version) with guest Geddy Lee on bass, followed by "Make It Easy" (excerpt)/ "Owner of a Lonely Heart" with Steve Howe playing bass. The five Yes musicians that performed all gave speeches. Bill Bruford joined them, but did not speak. Chris Squire was represented by his widow Scotty Squire and their caught Xilan Squire. Tony Kaye was not able to attend, due to health reasons, and was not acknowledged. The other members of Yes (Geoff Downes, Billy Sherwood, Jon Davison) were in the audience along with Steve Howe's eldest son, Dylan and also ex-Yes member Patrick Moraz. On the 5th of April, Yes (Howe, White, Downes, Sherwood, Davison) appeared live on SiriusXM radio, performing acoustic versions of "Leaves of Green", "Clap" and "Roundabout". On the 6th of April, Patrick Moraz performed a concert at which Downes and Sherwood made a guest appearance, performed "The Smile Has Left Your Eyes" as a duet in tribute to the late John Wetton. On the 8th of April, the day after Yes' Hall of Fame Induction, Steve Howe celebrated his 70th birthday with fellow Yes members White, Sherwood and Davison, his son Dylan and also Bill Bruford. Moraz rules!!! I know it would be daunting,but since all his tours involved playing hockey areanas and stadiums, he Might have played in front of more people than any Yes keyboard player! Rick and Steve! Its time to bury the hatchet and play together for the last time! I agree, the right individuals are being inducted. The only problem is where is Patrick Moraz. He should be on the list. The 1974,1975, 1976 era with Moraz was beyond the point of amazing. Maybe since he is only on 1 album, Relayer. But that album is better than every YES album with Trever Rabin put together.